After a year of playing gigs, writing songs, and developing their sound, The Once Hollow is proud to share their first studio recording with the world. This five song EP brings together just a few of the band's catchy tunes; with some up-tempo radio-rockers, and a few subtle heartbreakers, this recording crystallizes The Once Hollow's often hard to define, genre bending sound, into a tight, focused indie folk/rock gem. Rebecca Holtz provides a scorching performance, bringing to life each song's delicate, incisive lyrics with her powerful voice. Whether on the opening track - The One, a blue-grass influenced feminist anthem, or the heart rending elegy, Love Affair, Rebecca imbues empathy and strength into every word, every melody, and every vocal embellishment. Having produced, recorded, and mixed the album, as well as having added the additional instrumentation, Jon McAuliffe, with his gritty yet inviting backup vocals and intricate, solid rhythm guitar sets the bedrock for the EP, and helps to define the rising and lowering tides of the recording. Finally, the virtuosity of lead guitarist, Jeremiah Millay, vivifies the recording, adding eloquent, awe-inspiring solos and lead lines to every song. With technical mastery, and extraordinary "feel" - something that cannot be taught and few musicians have - Jeremiah punctuates this inaugural recording with his dynamic, soulful musicianship. With sophisticated, thoughtful lyrics, powerful, catchy melodies, and driving, radio-friendly songs, this impressive, self-titled, first record by The Once Hollow is bound to catch the attention of everyone who hears it! We just finished mastering our new 5-song EP which should be available for sale at this years Roots on the River festival in Bellows Falls, VT. We hope to see you there! The big news of the day is that you are reading this right now! Which means that The Once Hollow now has a home here at www.theoncehollow.com. Everything is happening pretty fast right now; we're writing new music, recording demos, developing our web presence, and booking gigs! In the near future we're planning on hitting some local open mics between VT and Mass, to hone some new material, so please check back soon and keep an ear out on Facebook, Twitter, Instagram, etc. etc. etc. We are SO excited to be here, with you! "Seldom do you actually find a diamond in the rough. 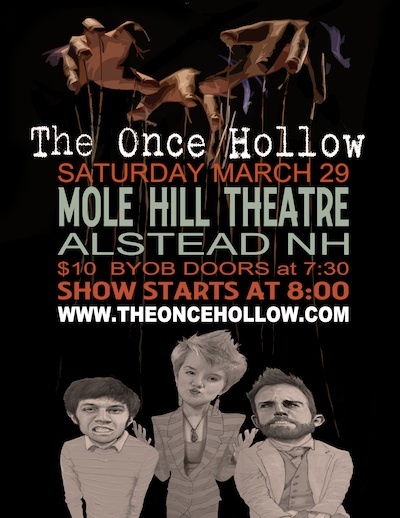 But on a cold night in January in the small village of Bellows Falls Vermont, I found the "the Once Hollow". The acoustic trio is dynamic, articulate and possesses a musical curiosity that sets them apart from any other bands in their genre. Folk on the cover, but sit through the first set of one of their live shows and you'll be treated to a fusion of jazz, soul, and a healthy dose of funk. The two guitarists, Jon McAuliffe and Miah Millay, complement each other like organic peanut butter compliments a fine strawberry preserve. Rounding out the group is a firestorm of vocal power in Rebecca Holtz. She can spin on a dime, turning a gentle soulful ballad into a musical experience, leaving the audience gasping for breath and cheering for more. Their live sets wind through a handful of classic covers paying tribute to artists like Aretha Franklin, Tom Petty, and Beyonce. And they don't just cover the songs they play. Instead, each tune has been thoroughly and creatively "Once Hollowed". Then there are the original songs screaming to be burned to disc and shared with the world. The Once Hollow is a band that needs to be seen and heard to fully appreciate. But don't take my word for it, get out and experience them for yourself. You won't regret it." Stop me if you've heard this one: two punk guitarists and a torch singer have three weeks to pull together a set for a gig.. But it's also the beginning of The Once Hollow. When people first hear the name, "The Once Hollow," they tend to stop and think about it. "I've noticed that they have to work through the meaning for themselves," says Jon McAuliffe, "but watching them, I love to see how they come through it, almost enacting the journey that we hoped the name would represent. Essentially, for us, it's about coming back to life." For lead guitarist, Jeremiah Millay, and guitarist / vocalist, Jon McAuliffe, The Once Hollow is just that: a coming back to life. Jon and Jeremiah got their start writing punk rock anthems in the band Blind Luck Music, but after disbanding and pursuing other ventures and careers, Jon and Jeremiah still continued writing music, expanding their musical vocabulary into jazz, folk, classical, and even electronica. But coming together with Rebecca to form The Once Hollow is really Jon and Jeremiah's first official re-emergence back into the music world. "The Once Hollow," says Jeremiah, "has given us the chance to bring all our experience together to make the best music we've ever made. We sort of felt like we had to get serious about it when it clicked so easily." For lead vocalist, Rebecca Holtz, The Once Hollow is the beginning of a new life of songwriting. For years Rebecca has lent her big voice to jazz bands, musical theatre, and whatever Tina Turner anthem is stuck in her head at any given moment. She's shared stages with legends like Charles Neville and Houston Person; been mentored by Samirah Evans; and studied with greats, like Jay Clayton, Sheila Jordan, and Peter Eldridge. Her natural vocal ability, at times delicate, revealing flourishes reminiscent of Ella Fitzgerald, and at other times big and gritty like Aretha Franklin, have made jazz her home for many years; however, she says, "The Once Hollow is a terrifying, thrilling freefall into the unknown, with two of the goofiest, most brilliant people I've ever met. It's the most exciting musical experience I have yet had." The Once Hollow's sound has developed in such a way that they hope a genre will never find them, preferring instead to exist at the crossroads of jazz, indie, folk, bluegrass, punk, blues, or whatever sound feels most urgent and fitting. As Jon once said, "The Once Hollow almost sounds like a Tom Petty record and an Ella Fitzgerald record making love while a Django Reinhardt album plays in the background." Most agree that Jon is not entirely sane.